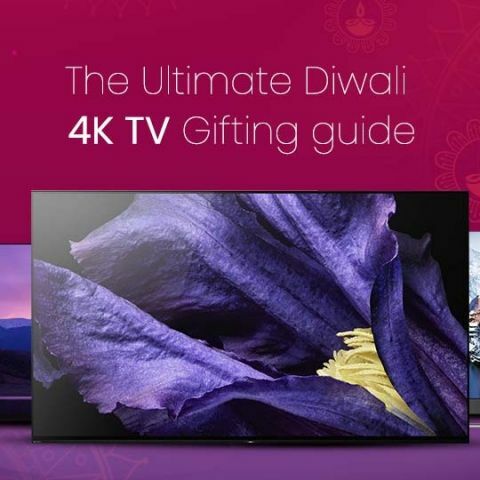 We've handpicked some 4K TVs for you so you can head to online stores and gift your loved one a new Diwali surprise. Most of them will burn a hole in your pocket, while others will seem pretty affordable, but Diwali is probably the best time to pick them up thanks to ongoing offers and discounts. Check them out. The best time to buy a TV in India is during Diwali. TV manufacturers offer good discounts, EMI schemes and some extra goodies to attract your attention. If you are looking to pick up the best TV that money can buy, then this is the list for you. We have thrown in a few mid-ranged TVs as well for those that don't want to sell an arm and a leg to acquire a flagship TV. These TVs comes in various sizes, so if you want, you can get some of the models in larger or smaller sizes based on your budget. If you are looking for the creme-de-la-creme from the world of TVs then you can consider the Sony A9F. The TV brings with it a Netflix mode which changes the settings to show you the content the way the creators intended it to be viewed. The TV boasts of 4K resolution with HDR 10 and Dolby Vision Support. The TV builds upon Sony’s Acoustic Surface technology and enhances upon it to give you a good sound experience from the TV. The TV runs on Android 8 and a unique thing about the TV is that you use the TV as a centre channel in your home theatre setup. The TV is available in 55-inch and 65-inch options and stars at Rs 3,99,990. You can buy the Sony A9F TV here. If you are looking for a good performing OLED TV and don’t want to sell your house to buy it, then you can consider the LG B8. The TV is available in 55-inch and 65-inch options starting at Rs 2,14,990. The TV brings with it LG’s ThinQ AI features and even though a lot of the AI features aren't available in India, you are getting a fantastic OLED TV with a fluid UI and slim design. The TV runs on LG’s webOS which is one of the better UIs found on a smart TV. You can buy the LG B8 TV here. Panasonic’s OLED TV brings with it a good design and an interesting set of smart features to distinguish it from the competition. The 55-inch TV is priced at Rs 2,99,000. The only downside is that it only supports HDR 10 and not Dolby Vision. Panasonic has a history of making some great TVs and from a content consumption perspective, you can’t go wrong with this one. You can buy the Panasonic OLED TV here. If size matters, and you want a 65-inch TV without spending as much as a flagship, then you can consider the TCL 65 X4. The TV boasts of QLED backlighting, a technology found on Samsung TVs. The 65-inch TV is priced at Rs 1,49,990 and runs on Android TV out of the box. It also comes with a soundbar below the TV to add to the audio experience from the TV. You can buy the TCL 65 X4 QLED TV here. If you are on a tight budget and want to experience 4K HDR, then you can consider the Mi TV 4 Pro. the TV runs on Android TV 8 out of the box along with the company’s own patchwall UI. It supports HDR 10 and has a 10-bit panel for you to exploit the TVs HDR capabilities. It comes with a compat remote control and is priced at Rs 44,999. Good luck getting your hands on one though. You can buy the Mi TV 4 Pro here. If its a Samsung Flagship TV that you are looking for, then you can consider the Q series TVs from the South Korean tech giant. The TV is available in 55, 65 and 75-inch options and with price starting at Rs 1,78,500. The QLED TV boasts of 4K resolution with support for HDR. The TV runs on the company’s own Tizen OS. You can buy the Samsung 55Q7FN TV here. If you want to get on the 4K bandwagon and want a 50-inch TV, then you can consider the Samsung NU7100. The TV is priced at Rs 63,490 boasts of 4K resolution and comes with Samsung’s TouchWiz UI. It has 3 HDMI ports and 2 USB ports for your connectivity needs. You can buy the Smasung NU7100 TV here. The Sony X75E is available in 43-inch, 49-inch and 55-inch options. The TV runs on Android and boasts of 4K support. The 43-inch variant is priced at Rs 67,990 and comes with 4 HDMI ports and 3 USB ports for your connectivity needs. You can buy the Sony X75E TV here. The iFFALCON 55K2A is a 55-inch 4K TV running on Android TV. The 55-inch TV is priced at Rs 43,999. It is available in 65-inch as well. The TV also boasts of HDR support. For your connectivity needs, the TV has 4 HDMI ports and 2 USB ports for your connectivity needs. You can buy the iFFALCON TV here. This series of LG TVs are available in 43-inch, 49-inch 55-inch and 65-inch options. The TV runs on WebOS and boasts of 4K support with active HDR. The 43-inch variant is priced at Rs 48,875 and comes with 3 HDMI ports and 1 USB ports for your connectivity needs. You can buy the LG TV here.